The study presented here uses Q methodology to explore the perceptions of teachers, paraprofessionals, administrators, and head teachers about leadership. Altogether, 84 employees from four different Norwegian primary schools were asked to rank-order 27 statements related to leadership. 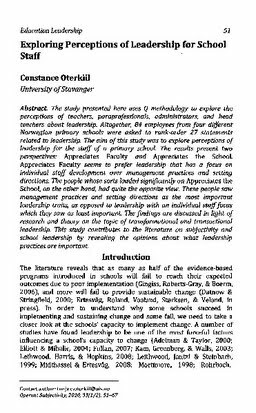 The aim of this study was to explore perceptions of leadership for the staff of a primary school. The results present two perspectives: Appreciates Faculty and Appreciates the School. Appreciates Faculty seems to prefer leadership that has a focus on individual staff development over management practices and setting directions. The people whose sorts loaded significantly on Appreciates the School, on the other hand, had quite the opposite view. These people saw management practices and setting directions as the most important leadership traits, as opposed to leadership with an individual staff focus which they saw as least important. The findings are discussed in light of research and theory on the topic of transformational and transactional leadership. This study contributes to the literature on subjectivity and school leadership by revealing the opinions about what leadership practices are important.